Instead of buying fasteners separately for installation by your employees, have Atlantic put together and deliver complete, inspected assemblies to you. 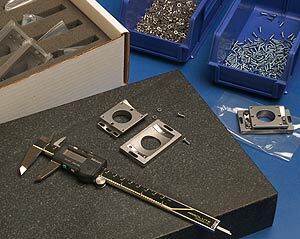 We do the same for a Connecticut measuring equipment manufacturer, for whom we pickup, inspect, assemble, package, custom label, and deliver these die cast optical assemblies. All of this means fewer worries for you.